What is this F&Q Camp? Should I be excited, or be excited!? First, you have to register in order to secure room and board (breakfast and dinner). We have a limited capacity, so it’s good to make sure you have a space. What is it like at CESTA? Access is somewhat limited at CESTA. Wheelchairs can be accommodated in the ground floor spaces (dining room, theater/concert hall), the garden and outdoor workshop spaces. The sleeping loft is up alot of steep stairs and not accessible for wheelchairs or people with mobility issues. Bring your earplugs, because we plan to have super fun parties on Friday and Saturday nights! IN THE ATTIC: One open loft space for up to 40 people sleeping on mattresses/foam mats on the floor (bring your sleeping bag), so there is not much privacy but it will surely be just like camp! IN YOUR TENT: If you manage to sign up in time, you can reserve a space in the beautiful garden for your tent. We have space for about 23 tents, after which that option will no longer be available, so please sign up for camping on your registration formula. Accommodations for anyone who prefers more privacy or has other sleeping needs can be found close by at Hostel Bernard Tábor (10 min walk) or Penzion Tábor (5 min walk). 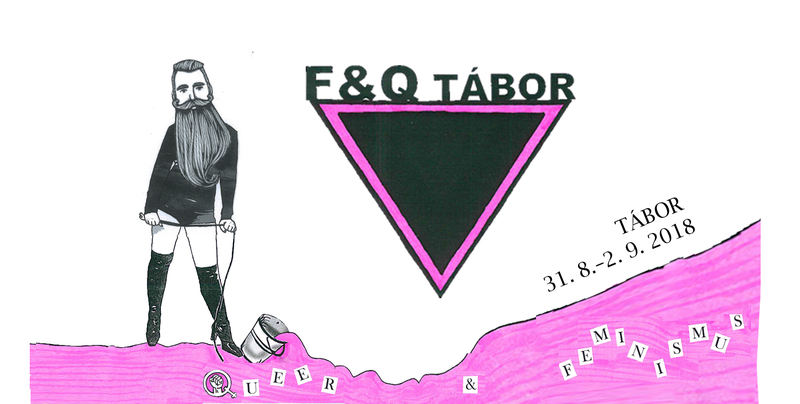 We are glad that there are proud queer feminist families among us, but unfortunately F&Q Tabor is not geared toward children and we don’t have the capacity to provide any special children’s space or activities. The workshops and discussions all include adult content. The CESTA building and grounds are not childproofed and could pose a threat to children’s safety (steep steps, unsecured/half-constructed spaces, an open pool of water in the garden, and more); in addition we will have an evening program and cannot guarantee a quiet sleeping environment for families. However, if you are a parent and want to attend, we can help you network with other parents for possible shared childcare. Unfortunately, Tabor is not an ideal environment for dogs. Cats live on the property, and sleeping arrangements for most will be in a group, where others might suffer from allergies. It is best not to bring your dog, but if you must, then please register to sleep in a tent and make sure you have the dog’s leash with you. In Czech, we say thirst is just hunger in disguise, and hunger is just gas in disguise… You can confirm or deny this theory at our pimped-up bar that will tease your empty gizzards. Manna from heaven, liquid and solid, cocktails – both virgin and like a virgin, tea and coffee, beer, wine, soft drinks and hard drinks. Please take advantage of our bar rather than your own personal mini bar 😉 Profits will be used to cover the travel costs of workshop leaders and musicians etc. Thank you for your consideration. By train! Tabor has great train service, and it’s just under 1.5 hours from Prague. By car? Leave your car at home (think of the planet’s climate change! ), but if you have to, you can certainly bring your car and park it somewhere nearby. For ridesharing, we will set up a network on our FB page, where you can find a ride or fill up your car with passengers! Feel free to ask us whatever via facebook or e-mail (chci@faqtabor.cz).